Watch Straps that never get wet? 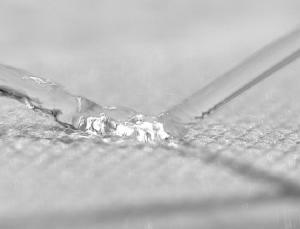 Researchers at the University of Zurich have developed a nanotech fabric technology that repels water. The fabric is made from polyester fibres coated with millions of tiny silicone filaments and when water falls on it, it stays as spherical balls on top of it until they are rolled off like marbles. So water can easily bounce off the fabric without leaving a trace.